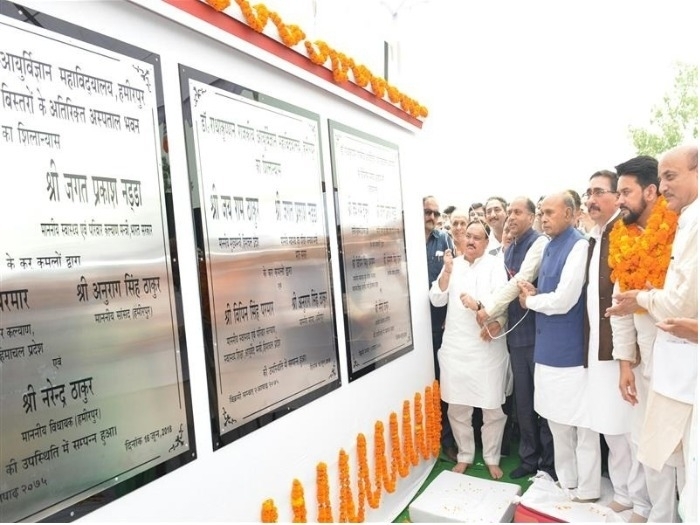 Shimla, June 19: In a bid to strengthen medical facilities in the state, Himachal Pradesh Chief Minister Jai Ram Thakur laid the foundation stone of 250-bedded hospital of Dr. Radhakrishnan Government Medical College in Hamirpur. Notably, CM Jai Ram Thakur along with laying the foundation stone of Medical College also inaugurated residential block of Dr. Radhakrishnan Government Medical College and performed online foundation of the college campus at village Thai. The 250-bedded hospital would come up at a cost of Rs. 206 crore while a sum of Rs. 1.91 core would be spent on construction of residential block. While addressing a public meeting on the occasion, the Chief Minister said it was a historical day for Hamirpur district as the much awaited medical college had finally been inaugurated. This sixth medical college of the state would have an intake of 100 MBBS students. The medical college would facilitate people of around four adjoining districts in providing best health services. He said that state government would always remain indebted to the union government for their liberal financial assistance and fulfilling all demands of this hilly state. He said with the cooperation of the centre, the state had started to witness a revolution in the field of health and other sectors. The previous government just kept showing dreams to the people and made hollow promises but the present government believes in realizing the dreams and within a short period of five months, the results could be seen on the ground. Jai Ram Thakur said the representatives of the Congress party from the state has always failed to take up the issues of the state interest effectively to the union government whereas the member of Parliament of the BJP had been constantly raising issues of railway expansion, construction of national highways, strengthening of health infrastructure, setting up of IIIT, central university and other institutions etc. in the state and all demands had been accepted by the centre. The Chief Minister also said the state government was working with a new vision and had started work on small initiatives to take Himachal Pradesh to new heights of development and prosperity. He said with six medical colleges in the government sector and one in private sector, around 750 doctors would be available to the state in the coming years which would help in meeting the demand of specialists and medical officers in the state. On the demand of local representatives, he assured that possibilities would be explored to construct bus stand, indoor stadium and parking slots at Hamirpur town. He also assured full support of the government to Senior Citizen Council, Hamirpur for construction of its building. On this occasion, Union health minister JP Nadda was also present.